Tourism officials appeared to downplay the impacts of storms Lane and Olivia that arrived weeks apart in August and September following the release of October tourism data last week. 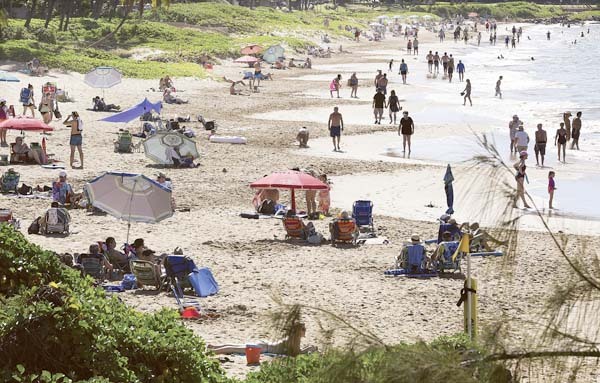 “We’re seeing increases in Maui’s month-over-month and year-over-year figures,” she said. Hurricane Lane veered away as it neared the islands, but tropical storm force winds whipped up a brush fire Aug. 24 that burned 1,500 acres in West Maui a few miles from the Kaanapali resort and damaged or destroyed more than 20 structures. Tropical Storm Olivia rolled through the West Maui Mountains on Sept. 12 causing flooding that washed away homes and flooded and damaged roads and caused power outages. Both storms received attention from the national media. Visitor spending was back up in October for Maui, rising 1.8 percent to $377 million with daily spending nearly the same as last October at $219 a day, Hawai’i Tourism Authority data released Thursday showed. Visitor arrivals by air to Maui increased 1.8 percent to 216,606 with growth from U.S. West (up 7.2 percent), the state’s top market, and U.S. East (up 2 percent), which offset declines from Japan (down 8.6 percent) and Canada (down 2.6 percent). The average number of visitors on Maui daily increased 2.2 percent to 55,608 in October. For the first 10 months of the year, visitor spending on Maui was up 10.9 percent to $4.26 billion and visitor arrivals were up 7.2 percent to 2,433,648 visitors — both on track to top last year’s record-breaking totals. “It’s been well reported that 2018 is going to end up being another banner year for tourism on Maui, and the credit needs to be given to our Maui partners who continue to deliver on our visitor promise as a world-class vacation destination unlike any other in the world,” said Duong. The growth in air seats to Maui — an estimated 12.6 percent this year — is helping fuel the “strong travel demand for Maui,” Duong said. There has been increased service from Denver, Chicago, Los Angeles and San Francisco and additional daily service from Portland, Ore., and San Diego. Visitor arrivals by air to Lanai in October were up 7.2 percent to 5,428 compared to a year ago. For the January-to-October period, arrivals are up 17.2 percent to 61,908. Molokai logged a 9.7 percent increase in visitor arrivals to 4,731 for October while arrivals for the first 10 months were up 3.5 percent to 49,490. Visitor spending on those two islands catapulted upward in October, up 249.4 percent to $4.4 million on Molokai and up 57.5 percent to $9.4 million on Lanai. For the first 10 months, Molokai visitor spending was up 24.1 percent to $33 million, and spending on Lanai was up 12.6 percent to 89.6 million. • The number of visitors to Maui only was up 6.6 percent in October and 9.7 percent for the first 10 months. • Cruise ship arrivals were up 14.8 percent to 29,000 for October, but down 2.3 percent for the first 10 months to 191,000. “Therefore, we must continue to remain focused on executing effective marketing programs to keep Maui Nui top of mind and competitive with other global destinations.” she said.